And then I might think to myself, “I don’t believe that’s where he should put his time and money because he can’t get the same data and make adjustments quickly and target as well.” So I might struggle to explain why I believe Facebook is a great marketing tool. I’m met with dead silence. And my sales pitch has hit a big dead end! What happened? I thought I was talking to my ideal client. Fish tanks are fun and pretty easy as far as pets go. You buy a tank. You buy some fish, plants, rocks and maybe a little plastic ship to sit at the bottom. You hook it all up, turn it on, test the water, get the temperature right, pour the fish in and then add some fish flakes. Some of the fish dart quickly to the surface to eat the food. But you’re surprised to see some fish swimming right through the food as it falls around them. In reality, different fish have different dietary requirements. Some need to be fed once a day; some need to be fed more often. Some like flakes. Some prefer pellets. Some are just downright picky. Once you realize that you can’t satisfy all of them with the same thing, you start throwing a couple of different kinds of food in the tank, cross your fingers and hope that all the fish can find exactly the food they need. It seems to work for a little while, and then you notice that some fish are getting really slow. They are so slow that they don’t even notice when you throw the food in. Then they start to go belly up. Every day you’re losing one or two until you’re left with just a small handful of fish. You’re feeling lucky that you have those, but the tank no longer looks like what you had envisioned. Instead of having a colorful and dynamic group of fish, you have just a few fish that all look the same. As business owners, we’re guilty of the same thing. We often think of our customers as one group. We confidently throw our marketing message out to them, sure that they’ll come running and gobble it up. When only a few people respond, we add a new, different message into a campaign, certain that now we have all the bases covered and we’ll get more people to respond. But as time passes, we’re only left with a small group of people and we wonder why our marketing efforts failed. The obvious answer is that our marketing message wasn’t right. For some reason it didn’t resonate with everyone, just like one kind of fish food wasn’t enough to sustain all the fish. But that’s not really what caused the problem. The real reason has to do with the goldfish, swordtails, tangs and dottybacks. Let’s get back to the pet store. You’re standing there in the aisle with fish tanks on one side and birds squawking on the other, wondering what the heck the fish expert is talking about…and he tells you that goldfish and swordtails are cold water fish and tangs and dottybacks are saltwater fish, and your mistake wasn’t really what you were feeding them at all. It was putting them in the same tank to begin with. When we think about marketing, it’s true that you need to find the right message. But the best message won’t work if you throw it into the wrong tank. The size – how many gallons of water do the fish need? The filtration – is it required or not? The condition of the water – what do we need to do to prepare it before we introduce the fish? The type of water – cold or salt water? 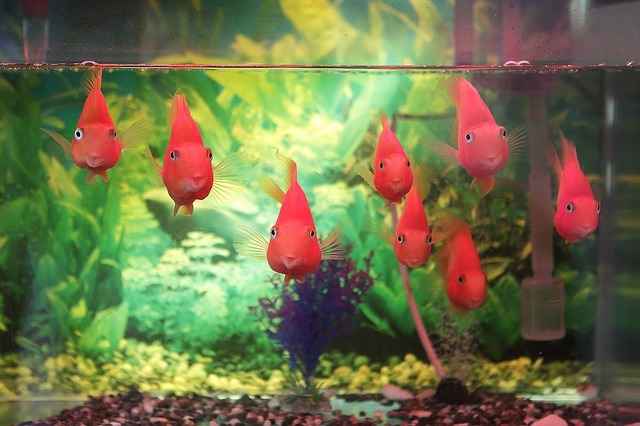 The other fish in the tank – which fish are happy together and which fish will eat each other? Their beliefs – the “rocks” – the values that they have that support all that they do. In the United States, we’re good at wearing these on our sleeves. What stickers are on the customer’s car (stick figures representing their family, a 26.2 logo, a pink ribbon, the name of a vacation spot, a college mascot? a politician’s name?) Do they wear a rubber bracelet stamped with words around their wrist or a pin on their lapel? Who’s in their school of fish? Who do they like to hang out with? Who do they hate to be around? Who do they need to hang out with to feel successful? Do they prefer to travel in groups or solo? Who do they measure themself against? Were they submerged gently into the tank in their own plastic bag and then released when the temperatures matched or were they dumped in and shocked? Are they conditioned to your industry or product/service? Or is it something new? Are they confident that you can help? Are they doubtful, leery, hopeful, suspicious, certain, or unsure? How ready are they to come to the surface when you toss in the fish flakes? How much do they know about the problem that you solve? Are they aware that they have it, aware of a wide array of solutions, or aware of your particular solution? Will you need to tempt them with more than just the usual “food” or message? For me, I know that my customer avatar is a business owner who struggles with knowing how to market their business and feels anxiety and worry about its future (“their water”). They want to create a steady stream of customers and revenue because they want to be able to provide financial security for their family and feel proud and successful among their peers (their oxygen). They are honest and hardworking and they look for those qualities in the people they hire. They consider themselves smart, and participate in professional groups that will help them learn and grow. They feel accountable and responsible for their own success, the success of their employees and the financial stability of their family so they are driven to find a solution. They understand that it is sometimes wiser to hire a consultant than to try to wear every hat in their business (their school and their rocks). They believe that digital marketing is powerful but they did not “grow up with it” and find all of the endless options very confusing. Because they have heard of many different strategies (SEO, PPC, social media…), they often misinterpret them as conflicting rather than complementary, and so they are wary of being taken advantage of (conditioning). When you go through this exercise, you confirm the basic characteristics (or demographics) of your “fish” – you know it’s a goldfish that will get to be about 3 inches long – but you also know all the other factors that are important to help it thrive and grow: the other fish that need to be in the tank, the kind of plants it needs, the temperature of the water, and of course exactly which kind of fish food works best. In fact, you know your fish so well that the minute you open the tank they come darting to the surface! Once your goldfish are happy in their tank you can add a second tank for dottybacks and start enjoying them too. Soon you’ll discover that it’s a lot less work to have several different tanks than it was to try to keep all the fish together in one, and they’re all thriving now too. Which comes first, the fish or the tank? As business owners, we have two choices. We can build a gorgeous fish tank and then add the fish, or we can fall in love with a certain type of fish and build the tank afterwards. I think most business owners spend a lot of time creating a beautiful tank that they love (their product), but not a lot of time figuring out if there are any fish for which it is perfectly suited (their customers). An ideal approach would be to find a group of people who have a problem and then build a solution that’s specifically for them. The critical point is that it doesn’t really matter which situation you’re in. The key is to make sure the tank and the fish match. Your “tank” needs to be perfectly suited to the fish and all of the contents inside of it. Of course you’re free to keep throwing your goldfish and dottybacks in the same tank, but if you’d rather keep them alive, you can get the Fish Tank Avatar Worksheet right here and start building your customer avatar today. UPDATE! I’ve added even more information to the worksheet to allow you to take an even deeper dive. Download the Fish Tank Avatar Deep Dive today.